I happened across a pair of Lucky Luke books in an O'Hare airport bookstore (of all places!) yesterday, and quickly snatched them up. I'm nominally familiar with the character and his significance in French comics, but I really haven't read almost any of those books. Only one, in fact: The Stagecoach, originally published in 1968. I was surprised, though, as I read through The Painter that Luke was not brandishing his trademark cigarette. Rather, he had a piece of straw/hay in his mouth. I thought perhaps that the art had been altered for the U.S. printing, much like how Sanji's cigarette was changed to a lollipop in some editions of One Piece when it was imported from Japan. But then I came across a scene in which Luke turns down smoking a peace pipe with an unnamed Native American chief because he "quit smoking a long time ago." Now, it's certainly possible that whole panels were redrawn here and the script was altered in the translation to accommodate that, but that seemed unlikely. Doing some digging, though, apparently Luke's famous cigarette was discarded in 1983 and this was indeed done to better accommodate American markets. The Painter story I came across was first published in 2001, so Luke had indeed quit smoking nearly two decades earlier. 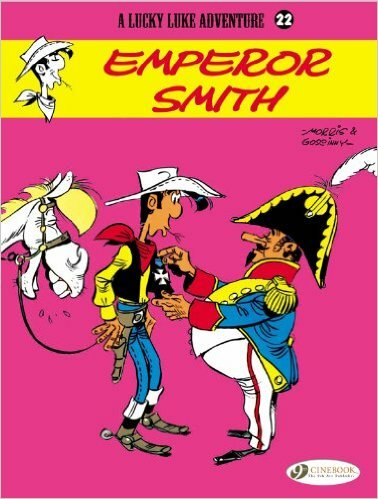 Interestingly, though, in going through the cross-sell pages in the back of these books, they sport the covers of the other 50-some Lucky Luke books that current American-rights-holder Cinebook has out. And in none of them is Luke smoking. He's either shown without anything in his mouth at all, or with that same piece of straw/hay. But, in comparing those covers to the original French versions, though -- many of which use the same art -- we can see that Luke was in fact smoking originally and that, for the covers at least, Cinebook opted to edit out the cigarettes. 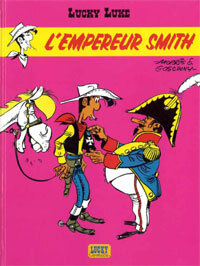 Lucky Luke debuted in 1946, and appeared smoking for 37 years. We're now 33 years away from when he stopped smoking, and many of his most visible cigarettes (i.e. the ones on the book covers) have been retroactively removed. Despite this, and the fact that I've officially read more stories of him not smoking than ones where he did, I can't shake the iconic image of Lucky Luke and his cigarette out of my head. That is some powerful imagery! And it is funny that the author is named "Morris" as "Philip Morris". In 1947 when the cartoon was born it was for sure a TOBACCO INDUSTRY project to sponsor the author, who has renamed him to "Moriss". More on that you can read in secret tobacco documents - or book The Golden Holocaust by professor Robert Proctor.